The Florida Bicycle Association supports statutory provisions to ensure the safety and rights of bicyclists. 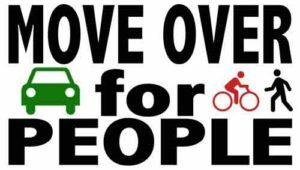 Expand the current Move Over law to include PEOPLE. This initiative on hold as we look to support HB 71 and SB 158 to create criminal penalties for causing bodily harm or death to vulnerable road users. Unfortunately, there is no movement for these bills. Make texting while driving a primary offense for all drivers and pass a hand-held device ban. These bills are moving through both chambers and could become law. Please support HB 107 and SB 76! – see our e-news updates (below) for sample language to contact your elected official. Create an E-Bike statutory definition to match national efforts. No bills filed this session. Clean up statutory language with regards to definitions of sidewalks, crosswalks, lane position of bicyclists and other related matters. No bills filed this session. 5. Support FDOT’s SUNTrail and Complete Streets initiatives, in addition to funding initiatives for natural surface trails. The 2019 session started on Tuesday, March 5, and concludes on Friday, May 3. Need an in-person walk-through on how you can be part of the process? Request an “Advocacy 101” presentation by completing our online form.